I frequently get questions about which option to use for creating AJAX and REST backends for ASP.NET applications. There are many solutions out there to do this actually, but when I have a choice - not surprisingly - I fall back to my own tools in the West Wind West Wind Web Toolkit. I've talked a bunch about the 'in-the-box' solutions in the past so for a change in this post I'll talk about the tools that I use in my own and customer applications to handle AJAX and REST based access to service resources using the West Wind West Wind Web Toolkit. In this post I'll demonstrate most of these features (except XML) in a few simple and short samples which you can download. So let's take a look and see how you can build an AJAX callback solution with the West Wind Web Toolkit. and drop it into the project by right clicking in your Project and choosing Manage NuGet Packages from anywhere in the Project. 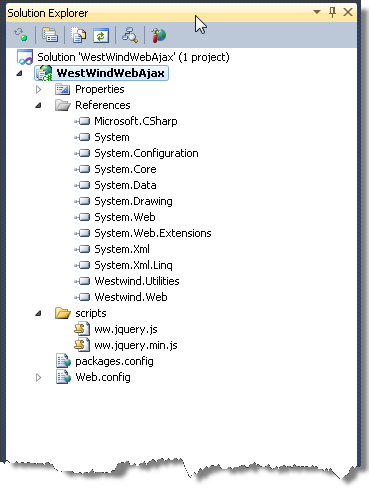 Nuget added two assemblies - Westwind.Web and Westwind.Utilities and the client ww.jquery.js library. It also added a couple of references into web.config: The default namespaces so they can be accessed in pages/views and a ScriptCompressionModule that the toolkit optionally uses to compress script resources served from within the assembly (namely ww.jquery.js and optionally jquery.js). The West Wind Web Toolkit supports several ways of creating and accessing AJAX services, but for this post I'll stick to the lower level approach that works from any plain HTML page or of course MVC, WebForms, WebPages. There's also a WebForms specific control that makes this even easier but I'll leave that for another post. So, to create a new standalone AJAX/REST service we can create a new HttpHandler in the new project either as a pure class based handler or as a generic .ASHX handler. Both work equally well, but generic handlers don't require any web.config configuration so I'll use that here. In the root of the project add a Generic Handler. I'm going to call this one StockService.ashx. Once the handler has been created, edit the code and remove all of the handler body code. Then change the base class to CallbackHandler and add methods that have a [CallbackMethod] attribute. It's an easy way to create cleaner URLs and still get the same functionality. Then to call the HelloWorld method a little jQuery is used to hook the document startup and the button click followed by the $.getJSON call to retrieve the data from the server. .getJSON() expects a full URL to the endpoint of our service, which is the ASHX file. We can either provide a full URL (SampleService.ashx?Method=HelloWorld&name=Rick) or we can just provide the base URL and an object that encodes the query string parameters for us using an object map that has a property that matches each parameter for the server method. We can also use the clean URL routing syntax, but using the object parameter encoding actually is safer as the parameters will get properly encoded by jQuery. The result returned is whatever the result on the server method is - in this case a string. The string is applied to the divHelloMessage element and we're done. Obviously this is a trivial example, but it demonstrates the basics of getting a JSON response back to the browser. The previous example allows you basic control over the data that you send to the server via querystring parameters. This works OK for simple values like short strings, numbers and boolean values, but doesn't really work if you need to pass something more complex like an object or an array back up to the server. To handle traditional RPC type messaging where the idea is to map server side functions and results to a client side invokation, POST operations can be used. The easiest way to use this functionality is to use ww.jquery.js and the ajaxCallMethod() function. ww.jquery wraps jQuery's AJAX functions and knows implicitly how to call a CallbackServer method with parameters and parse the result. So we point at SampleService.ashx and the GetStockQuote method, passing a single parameter of the input symbol value. Then there are two handlers for success and failure callbacks. The success handler is the interesting part - it receives the stock quote as a result and assigns its values to various 'holes' in the stock display elements. The error object has a isCallbackError, message and stackTrace properties, the latter of which is only populated when running in Debug mode, and this object is returned for all errors: Client side, transport and server side errors. Regardless of which type of error you get the same object passed (as well as the XHR instance optionally) which makes for a consistent error retrieval mechanism. If you're building REST style API's this might be useful to force certain request semantics onto the client calling. For the above if call with a non-allowed HttpVerb the request returns a 405 error response along with a JSON (or XML) error object result. The default behavior is to allow all verbs access (HttpVerbs.All). Up to now the parameters I passed were very simple. But what if you need to send something more complex like an object or an array? Let's look at another example now that passes an object from the client to the server. Keeping with the Stock theme here lets add a method called BuyOrder that lets us buy some shares for a stock. This is a contrived do-nothing example that simply echoes back what was passed in, but it demonstrates how you can pass complex data to a callback method. The code creates an object and attaches the properties that match the server side object passed to the BuyStock method. Each property that you want to update needs to be included and the type must match (ie. string, number, date in this case). Any missing properties will not be set but also not cause any errors. Clearly we've made this server method take more code than it did with the object parameter. We've basically moved the parameter assignment logic from the client to the server. As a result the client code to call this method is now a bit shorter since there's no client side shuffling of values from the controls to an object. which directs the function to include form variable POST data when making the service call. Other options include PostNoViewState (for WebForms to strip out WebForms crap vars), PostParametersOnly (default), None. If you pass parameters those are always posted to the server except when None is set. which replaces the manual Request.Form reading code. It receives the object to unbind into, a string of properties to skip, and an optional prefix which is stripped off form variables to match property names. The component is similar to the MVC model binder but it's independent of MVC. Calling this method results in just a plain string - no JSON encoding with quotes around the result. This can be useful if your server handling code needs to return a string or HTML result that doesn't fit well for a page or other UI component. Any string output can be returned. You can also return binary data. Stream, byte and Bitmap/Image results are automatically streamed back to the client. Notice that you should set the ContentType of the request either on the CallbackMethod attribute or using Response.ContentType. This ensures the Web Server knows how to display your binary response. Using a stream response makes it possible to return any of data. 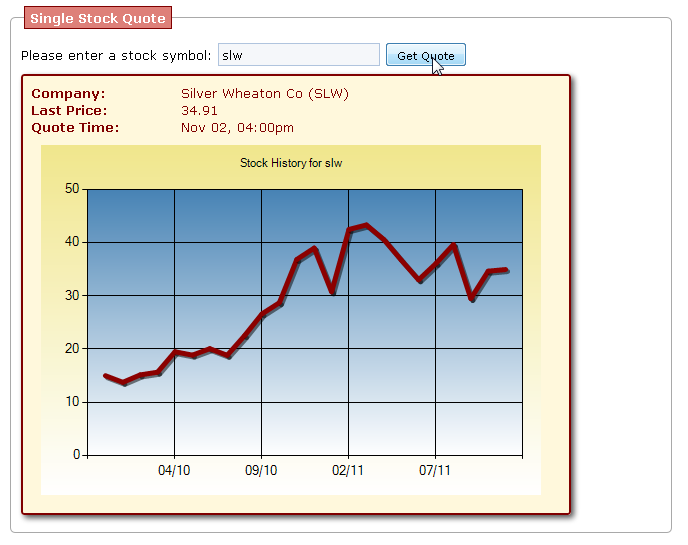 The charting code uses the new ASP.NET 4.0 Chart components via code to display a bar chart of the 2 year stock data as part of the StockServer class which you can find in the sample download. The ability to return arbitrary data from a service is useful as you can see - in this case the chart is clearly associated with the service and it's nice that the graph generation can happen off a handler rather than through a page. Images are common resources, but output can also be PDF reports, zip files for downloads etc. which is becoming increasingly more common to be returned from REST endpoints and other applications. Obviously the examples I've shown here are pretty basic in terms of functionality. But I hope they demonstrate the core features of AJAX callbacks that you need to work through in most applications which is simple: return data, send back data and potentially retrieve data in various formats. All these features are available in various solutions but not together in one place. I've been using this code base for over 4 years now in a number of projects both for myself and commercial work and it's served me extremely well. Besides the AJAX functionality CallbackHandler provides, it's also an easy way to create any kind of output endpoint I need to create. Need to create a few simple routines that spit back some data, but don't want to create a Page or View or full blown handler for it? Create a CallbackHandler and add a method or multiple methods and you have your generic endpoints. It's a quick and easy way to add small code pieces that are pretty efficient as they're running through a pretty small handler implementation. I can have this up and running in a couple of minutes literally without any setup and returning just about any kind of data. 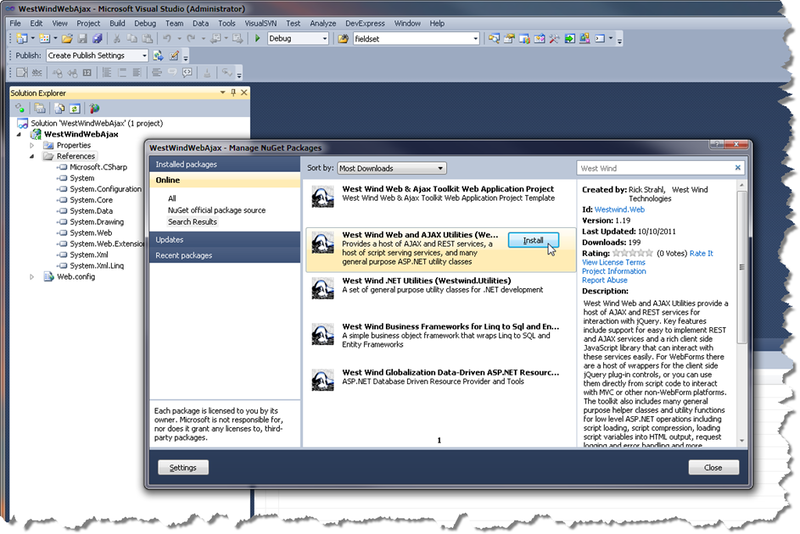 Have you looked into the new WebAPI stack from Microsoft? You can get it at http://wcf.codeplex.com/. Don't let the WCF in the name fool you, it looks and feels nothing like WCF. They are building a complete REST stack, and have been seeking more community feedback on the stack. @Don - yes I've been following WebApi closely actually. I'll have a similar post on it shortly. I think feature wise WebApi nails it pretty well although there are number of things that I don't like (DataContract Serializer, separate JsonValue class and a few other things). However, I think it's a big step in the right direction! Still I also think that WebApi duplicates what you basically could do already from the ASP.NET stack (creating full featured Http access basically) on the server side. With raw ASP.NET you have access to just about everything from low level to high level and I suppose that is part of what appeals to me with my solution. Most folks who end up doing Callbacks and REST APIs are already building Web apps and using the same stack and so are fairly familiar with it without having to embrace another API. The only big advantage of WebApi I see is that you can host it outside of IIS which can be useful, but frankly is not that important to me or anybody I work with. I have to take another look though - it's been a while since I've played with WebApi extensively and I definitely like what they're doing with the client side as well - .NET really needs that part because native HTTP support currenty is pretty basic. once again, a very nice job. I've been at this for 10 years now and it seems that you teach me something new every month! Quick question, how can I define in my Handler if the method should only accept POST, or GET? return null;  // must still return a result here! which returns an error response (as a 500 result unless you override the StatusCode) to the client. which results in a 405 result, but also an error object response. Code's checked into the Subversion Repository and can be retrieved from there - it'll be added to the next release. At first, I was blown away by the lack of plumbing. It was all just so...easy. Then, when you returned an image and called the method requesting the image by merely setting the src attribute on an image from the client side...that kinda blew my mind. I have seen strings get shuttled around in my own code and all over the internet, but this thing passes back ANYTHING. @Ryan - Yes that's the idea. You should be able to return just about anything easily. I frequently use this as a generic endpoint handler for an application unrelated to services - almost every app has something like an Image service or an upload endpoint that doesn't fit into pages and this setup is perfect for that! But I ran into some problems when returning a TreeNode-type which is a class I created. which you can also set in Application_Start. Once set it will make the default parser serialize properties as well. Code checked into the repository.